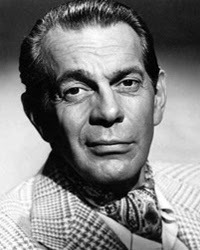 Today's star is the renowned character actor Raymond Massey. TCM is celebrating the career of Raymond Massey with 12 movies on Aug. 8. Here's what you need to know about Massey, who was famous for playing historical figures. FYI: TCM sometimes changes the air times and /or movies, so you can go to www.tcm.com to check the updated schedule. Born: Aug. 30, 1896, in Toronto. Died: July 29, 1983, in Los Angeles. He is buried in Beaverdale Memorial Park in New Haven, Conn.
Academy Awards: Massey was nominated for best actor for Abe Lincoln in Illinois (1940). Brief bio: Massey was born to a wealthy Canadian family with English roots. He graduated from Balliol College, Oxford, but he enlisted in the Canadian Army after the outbreak of World War I and he was severely wounded while fighting in France. After returning from the war, Massey worked in his family's tractor supply business, but he had caught the acting bug while appearing in amateur plays in the army. Massey moved to London in the 1920's, and he soon had a flourishing career in the West End. Massey moved into British movies with the introduction of sound. He played Sherlock Holmes in The Speckled Band (1931) and the villainous Citizen Chauvelin in The Scarlet Pimpernel (1935). Massey eventually moved to Hollywood where he became renowned for playing historical characters, especially Abraham Lincoln. Massey continued to get great film roles in the 1950's -- he played James Dean's stern father in East of Eden (1955) -- but he largely turned to television where he gained a whole new generation of fans by playing the avuncular Dr. Gillespie in the hospital drama Dr. Kildare. Raymond Massey and Richard Chamberlain on the set of Dr. Kildare. Fun fact: Massey's two children, Anna and Daniel, both became actors. Signature role: Massey played Abraham Lincoln on stage, screen, and television. 1. Santa Fe Trail (1940), airing at 11:30 a.m., is officially another Errol Flynn/Olivia de Havilland Western, but Massey gives a virtuoso performance as radical abolitionist John Brown. 2. Abe Lincoln in Illinois, airing at 10:15 p.m., was a huge Broadway hit for Massey. The film recreates Lincoln's life before he became president with Ruth Gordon giving an especially fine performance as Lincoln's troubled wife, Mary. 3. The dark comedy Arsenic and Old Lace (1944), airing at 5:45 p.m., finds Massey as the creepy brother of Cary Grant, who has been surgically altered to look just like Boris Karloff. A great film not featured on Summer Under the Stars: The Woman in the Window (1944) is a great film noir co-starring Edward G. Robinson and Joan Bennett and directed by Fritz Lang. Massey plays a district attorney whose friend (Robinson) is a possible killer. 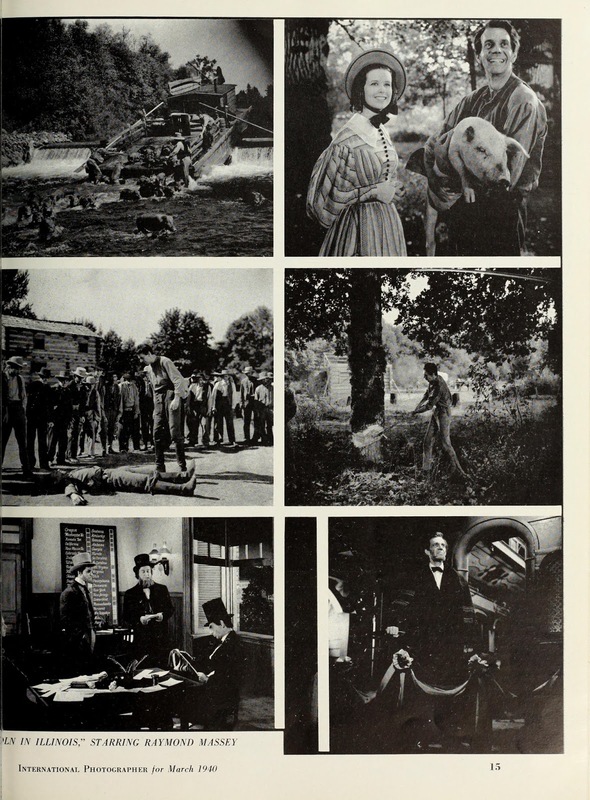 Fan Magazine Flashback: International photographer magazine ran a series of snaps from the production of Abe Lincoln in Illinois. Courtesy of the Media History Digital Library. Video: This vintage clip from the Chesterfield Supper Club TV show features singer Perry Como trying to teach his daughter (played by the Denise Alexander) the Gettysburg Address. Como struggles until he gets an Honest Abe intervention courtesy of Massey. For more Summer Under the Stars articles, go here. There'll be plenty more on Massey on social media. Follow me on Tumblr, Google+ or Pinterest or like us on Facebook. Follow us on Twitter @oldhollywood21.